Triargin is an all-natural supplement that promotes cardiovascular health, enhancing physical performance as well as mental clarity. Our all-natural ingredients promote the production of Nitric Oxide (NO), a vital component of a healthy cardiovascular system. This leads to enhanced physical performance, body health and mental clarity. 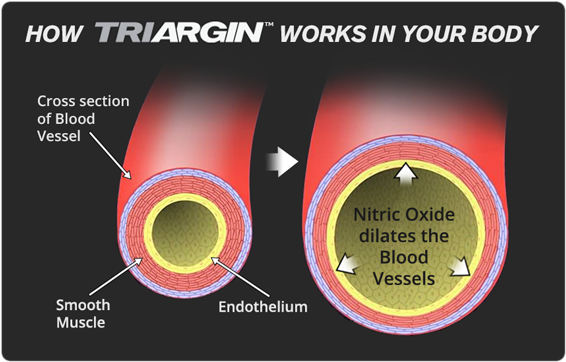 Nitric Oxide, Triargin’s key ingredient, transmits messages to and from cells throughout your body and is a vital component in increasing blood flow. NO also helps to regulate numerous activities of the lungs, brain, liver, and other organs, as well as speed-up cell growth and recovery times. Imagine what promoting micro vascular blood can do for your body. The cellular level is where all the action is in the human body. This action occurs throughout your body, bringing nutrients to the cells and taking toxins away everywhere. This is why people report more energy, alertness, and concentration. In promoting the micro vascular circulation, people note results with swollen, tired and restless legs and so much more. Nitric Oxide also affects overall physical performance, helping to deliver the adrenaline and hormones necessary for optimal endurance levels. In a 2010 UCLA study, participants who were given NO supplements over a period of three-weeks showed nearly a 17% increase in their anaerobic thresholds, whereas participants given the placebos saw no increases whatsoever. The anaerobic threshold is a reliable predictor of one’s aerobic ability or physical endurance levels -it represents the point at which lactic acid begins accumulating in the muscles, resulting in a sharp decline in the body’s ability to exert physical energy. A common example of experiencing this threshold is when you begin to have abdominal cramps while running longer than usual distances. Triargin’s ingredients can help to raise this threshold!